It’s interesting to see the difference between our dogs when the temperature plummets. Jason our husky mix enjoys rolling in the snow and following me around on frigid mornings as I top up the bird feeders. Bella our American foxhound sticks her nose through the doggy door, feels the cold air and immediately goes back to curling up on the couch. When it does come time to take her outside, we have to put on her winter jacket. 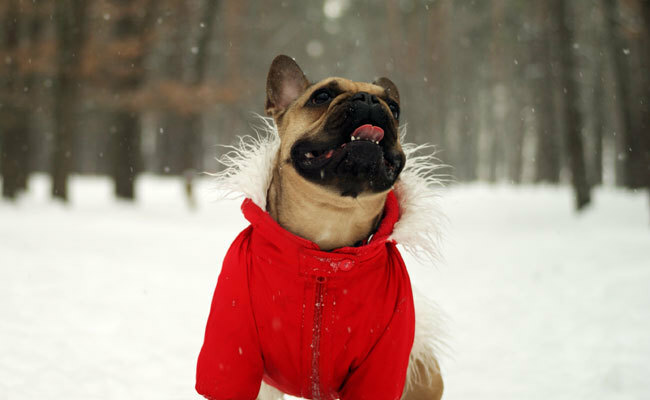 Whether or not your dog needs a winter coat depends on the dog’s natural coat and breed type. Veterinary experts say that short haired breeds, seniors, puppies and dogs with medical conditions can benefit from the extra warmth. It’s important to have several jackets or sweaters on hand so you always have a dry one available when your dog goes outside. Doctors Foster and Smith provide helpful guidelines on how to measure your dog for jackets, sweaters and boots. Stick to short walks or exercise periods during extremely cold weather. 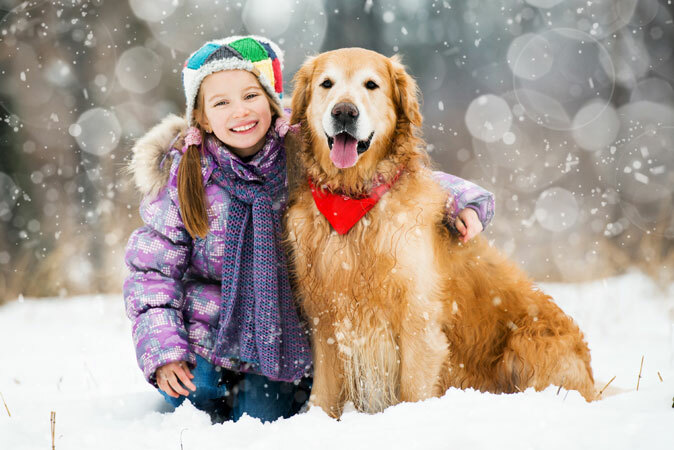 Keep in mind that if it’s too cold for a human family member to be outside for prolonged periods of time, then the same is probably true for our pets, especially older pets. Repeatedly coming out of the cold into dry heat or forced air can cause itchy, flaking skin in pets. Keeping your home humidified can help with this problem. Dry and oily skin conditions are the most common skin irritations during the winter season. Because dandruff is a symptom of both conditions, veterinarian Robert Gordon, owner and director of the Oakland Animal Hospital, NJ said that it’s important to get a diagnosis from a veterinarian. For dry skin issues, veterinarians may suggest a medicated shampoo or dietary supplement. In the case of oily skin, a skin scraping at the veterinary hospital can rule out parasites or a yeast infection before determining the right course of treatment. The most obvious signs of seasonally-related skin conditions in cats include dry, flaky skin, scratching, licking and or chewing, especially around the neck and face. Loss of fur and loss of sheen on the coat and a coarse coat appearance. Gordon recommends frequent brushing to remove loose hair and to prevent matting. In addition, brushing stimulates natural oil secretions in a cat’s skin and disburses the oil from the fur down into the skin. Cats can also suffer from dry or oily skin. And just as with dogs it’s important to get a correct diagnosis from a veterinarian. Neal Beeber, surgical director at Rutherford Animal Hospital, Little Falls Animal Hospital and Cats Exclusive Animal Hospital, all located in Northern New Jersey advises pet owners to pay special attention to senior pets during the winter. Many older pets suffer from arthritis, a condition that can be aggravated by cold weather. Notice whether or not your senior is slowing down appears stiff or is reluctant to go on walks. There are many treatments that can help alleviate pain in older pets. These treatments include prescription anti-inflammatory drugs, dietary supplements, massage, acupuncture, laser treatments and physical therapy. Beeber said owners should have a complete examination from their veterinarian to determine the cause and area of pain before starting any treatments. Dogs can cut their feet on sharp frozen snow or ice so check the pads for any injuries after returning from a walk. In addition, pads can become irritated from ice melt chemicals on the sidewalk. Dogs’ paws should be rinsed off following a walk if there is any concern about having come in contact with chemicals. Use only pet-friendly ice melt on walkways around your home and bring a towel on long walks to clean off stinging, irritated paws. Massaging petroleum jelly into paw pads before going outside helps to protect from salt and chemical agents. Some pet owners use booties to protect their dog’s pads. If you choose to use them, make sure they fit properly. According to the American Veterinary Medical Association (AVMA), when temperatures dip below 20 degrees Fahrenheit, outdoor dogs and cats should be brought in the house. At this temperature, outdoor animals can get frostbite on their noses, ears and feet. Extra caution should be taken with very young or elderly animals as they are especially vulnerable during the winter. The sweet taste of antifreeze makes it very desirable for our pets. If ingested, antifreeze can be deadly for animals. If you keep antifreeze in the garage, consider purchasing a pet-friendly brand in case of spills. Do not allow pets to lick anything from neighbors’ driveways or roadways. If you suspect your pet has ingested antifreeze, contact your veterinarian immediately. It’s not unusual for outdoor cats to hide under the hood of cars to take advantage of heat from the engine. When the motor is started, the cat can be injured or killed by the fan belt. If there are outdoor cats in your area, bang loudly on the car hood or honk the horn before starting the engine to give the cat a chance to escape. While most people are aware of the dangers of leaving a pet in the car during hot summer months, the same applies during the winter. Experts at the AVMA caution that cars become extremely cold in the winter and pets can suffer from hypothermia. Make sure there are screens around fireplaces and wood burning stoves so that pets can’t get too close and get burned. Space heaters should also be off-limits to prevent injury and the threat of fire if knocked over by a pet.